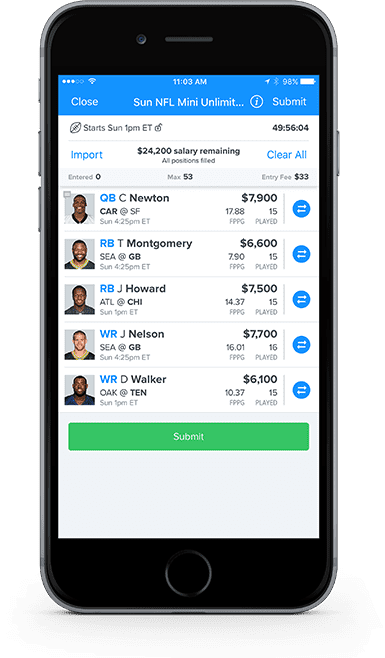 Every week since NFL Week 1, we’ve offered $20,000 to whoever can assemble the best FanDuel Mini Unlimited roster possible. And every week there wasn’t a winner, we added another $20K to the grand prize. But we believe it’s not a payout unless it’s actually paid out. So in Week 17, we’re giving the entire season’s payout — all $340,000 — to whoever gets the highest score. No perfect lineup required. FanDuel Mini is our newest contest format. With smaller, 5-man rosters, it’s never been easier to set your lineup on the go. In a Mini Unlimited contest, there are no salary cap restrictions — so you can pair as many Pro Bowlers as you want. That means the first Golden 5 payout might happen sooner than you think — will you be the one to claim it?